We want to test as much code as we can forever, right? So how do we go about actually achieving that? We want to test as much code as humanly (or mechanically) possible, right? Yes and no. 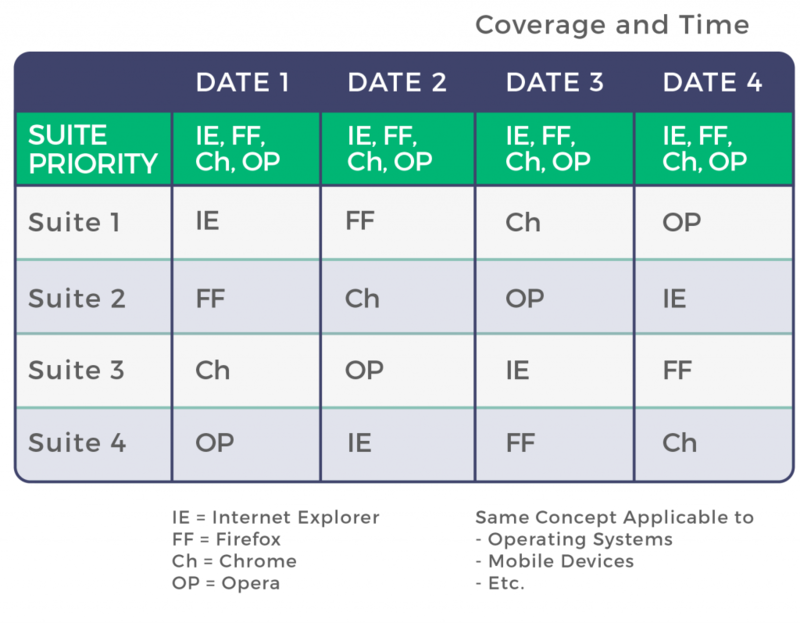 For each test cycle, it’s important to consider multiple strategies for measuring test coverage and to put a system into place where it can be maximized in the long-term as well. Test coverage is one of the measurements of test quality that tells us how much of the application under test has been tested. As I explained in a past post, it is a little bit like sweeping the floors of a home. When I sweep my house, I always forget to sweep some part, like the upstairs bathroom, so my sweep coverage fails to include that room. Imagine if I only included sweeping bedrooms for my sweep coverage criteria. With that criteria, if I swept 100% of the bedrooms, would that mean that the whole house is clean? No, because I completely missed the kitchen, dining room, bathrooms, etc! Therefore, we must always be careful with test coverage and recognize that sometimes it has its limitations. We find test coverage useful for defining certain entities of the system with the intent to cover them with tests. It also tells us when we have tested sufficiently, gives us ideas of what else to test (thus expanding coverage), and helps us know quantitatively the extent of our tests. It’s a great measuring stick, but even with 100% coverage we will never be guaranteed that our application is bug-free. 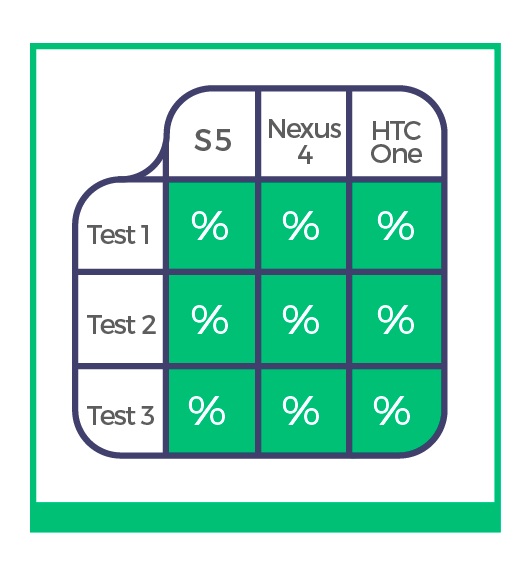 It’s also important to note that percentage of test coverage isn’t everything. Even if you only managed to achieve 20% coverage, it wouldn’t be a bad thing because the ideal amount of test coverage should be determined after running a risk analysis and should be in line with your priorities. There are many ways to consider test coverage. Here I am going to look at code coverage, data oriented coverage, and the plethora of other techniques at a tester’s disposal. Code coverage is the most popular metric for measuring coverage. There are different levels — not only lines of code covered, but also branches, decisions inside logic constructors, etc. With data oriented coverage, you have input and output parameters, each of them having their own domain (the spectrum of possible values they can have) and if you think about all the possibilities, you see you end up with a cartesian product (because you can test every possible combination). On the other hand, you can test less and go with “each choice” coverage, which means that you choose at least each possible value at least once. There is also all-pairs, which is empirically said to have the best cost-benefit relationship, being the best mix between each-choice and all combinations. In addition to those previously mentioned, there are several more ways to cover the product that you are testing such as state-machines, decision tables, decision trees, equivalence partition and boundary values, etc. It’s very interesting to see that each technique is supported by an “error theory”. The error theory takes into account the typical errors that programmers commit, as for example, equivalence partition and boundary values consider the error of, for example, using a “<” instead of a “<=”, misunderstanding business logic, or for example, decision tree tries to execute all the “decisions” and combinations of interesting conditions that a program has, which is nothing more than trying to maximize the branch coverage in the code. Additionally, there are other kinds of test coverage that are not related to lines of code or inputting test data. One thing we must cover is mobile fragmentation: are we covering the main mobile devices, operating systems, and screen sizes? When it comes to browsers and operating systems, we must consider how will our web system behaves in any combination of operating systems and browsers and how many combinations we should try. Lastly, we must think about the test environment, context, etc. To illustrate the main idea, say we have different features to test on different browsers and we have organized different test cases with different test suites, each one with its own priority. We need to execute the most critical against all browsers, but the rest, we can decide to execute on a different browser. In the following test cycles, we can exchange all pairs (suite/browser). That way, in each test cycle we do not have great coverage, but after multiple test cycles we improve it. We cannot ever be assured that we are done with testing, but when time is scarce, we have to use it wisely and do our best to reduce risk. Where it says “date 1”, it could also say “sprint 1”, “iteration 1”, “day 1”, “version 1”, etc. The goal here is to distinguish which test cases you will execute in each iteration in each environment. For some of them it is mandatory to execute test every time time on all browsers (probably the most critical ones). Others can be divided into groups and executed only in one browser, but in a very clever way in order so that each is executed in each browser by the 4th execution.